Night Owl Reviews rated it 4.25 stars! Here's what Silvermage said: "Looking for a book with a smart and feisty heroine? That’s what you get in Angels, Sinners and Madmen. The hero Sam is cocky yet honest as well as strong and caring after you get to know him. The banter between Livvie and Sam creates sparks. Friendship moves to more as the story progresses. These two have a wonderful relationship that is tender yet exciting. The chemistry is all there. I enjoyed this story from the start to the finish." Thanks so much, Silvermage! I'm so glad you enjoyed it. Award-winning author Margaret Tanner gave it five stars on Amazon, saying: "This intriguing novel, brilliantly written by Cate Masters, is set in the 1850's in Key West and tells the story of the wreckers, men who salvage the cargo from sunken ships. Wrecker, Sam Langhorne rescues aspiring author Livvie Collins from the sea when her ship flounders. They are instantly attracted to each other, yet fight the magnetic pull because Sam is hiding a secret, and Livvie is expected to marry a wealthy man of her own social standing. For these two characters to get together seems well nigh impossible, but the author has skilfully drawn them together. Sam the brave wrecker who risks his life diving to the ocean floor during salvage operations. Livvie the aspiring novelist, who fights against the restraints of genteel society. You will be enthralled with these two characters along with the rest of Sam's wrecker friends and the ladies from the local tavern. 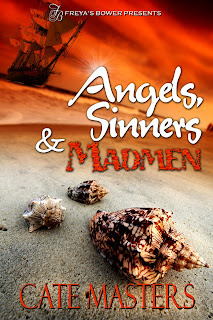 Laughter, tragedy and heroism abound, so make sure you have plenty of time when you start reading Angels, Sinners and Madmen, because you will not want to put this gripping story down until you have read every single word of it." Coming from such an incredible historical writer as Margaret, the compliment seems double. Much appreciated, Margaret! And if you've never read one of Margaret's books, I recommend you do. The first chapter of Angels Sinners and Madmen is on my web site, along with an excerpt. It's available from Freya's Bower, Amazon and other online book sites. congrats on the great reviews! !